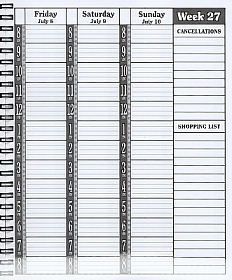 A smaller, full-featured appointment book designed by a nail tech and hairdresser, specifically for the beauty industry. Great especially for booth renters or as a "pedicure book". Small size (7 1/2" x 8 1/2") makes it convenient to take with you and with all these features, it's an all-in-one book. Full week at a glance. 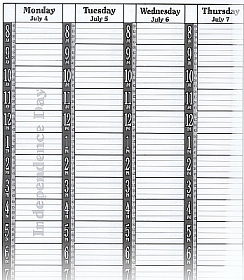 Pre-printed dates and days. Holidays ghost printed on the appropriate days. Cancellation section. Shopping list for supplies each week. Client profiles. Supplier information. Even a place to summarize expenses by week for quarterly tax purposes.